Now, this is the soup that started it all. My mother made me this soup when I had both of my kids and it is simply my favorite soup of all time. It was so good I felt like building a business to share the magical soup with my community. This is not your typical chicken soup. It is a classic Cantonese recovery soup that families serve new mothers. It is also good for people low in qi (akin to feeling low in energy or weakened). There are two versions: a yellow (Vikon) chicken known as Qing Ji Tong, and a special black (Silkie) chicken called Wu Gu Ji Tong). This was our packaging label. 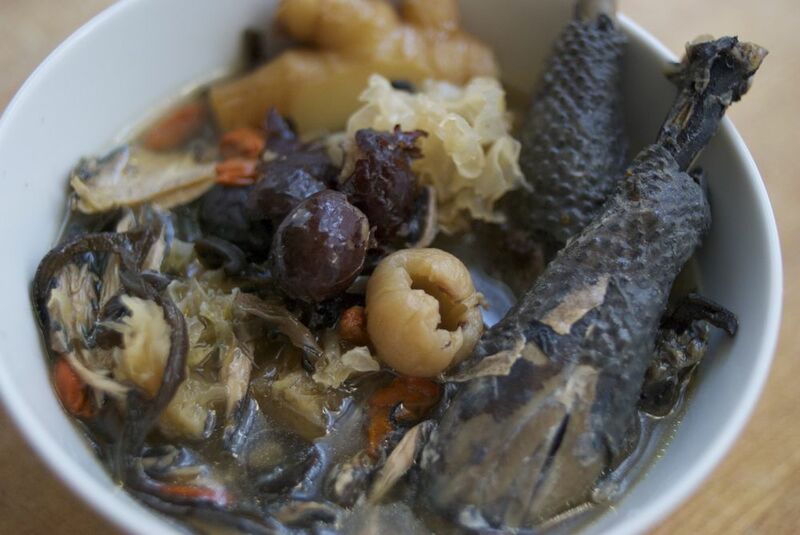 Wu Gu Ji Tong is a black chicken soup. Black chickens are Silkie chickens. Silkie chickens have been prized for their medicinal value since the seventh century. Women who have just given birth eat it for energy, but it's curative powers are not gender-specific. 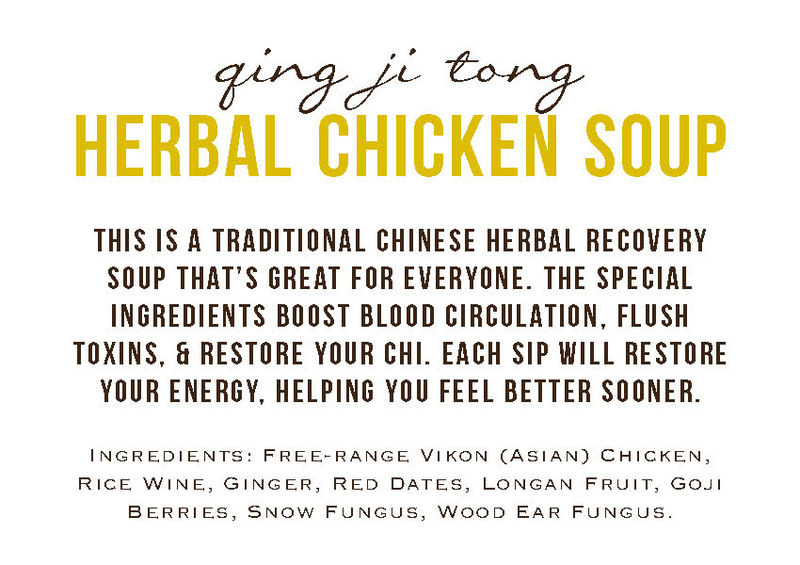 The recipe for Herbal Chicken Soup will be included in the upcoming book New Urban Eating. The recipe was published in the East Bay Express. Here is an annotated version of the recipe. It is best to find ginger that is young and bulbous. The more juice in the ginger the better. There are two tips that the elders gave me: 1. use rubber gloves, the ginger juice can really burn if you handle it a lot. 2. No need to use a peeler, just use a spoon to peel the ginger. Red dates (aka jujubes or hong zao) are believed to nourish the blood. They taste like apples and can be eaten raw, dried, or boiled. Make sure to buy the dates that are pitted. Red dates make soups and teas sweeter. Red dates are known to help maintain healthy blood pressure and to assist the stomach and the spleen in poor appetites. Red dates are often used to address stress and shortness of breath. Red date teas are also traditionally used after menstruation to help circulation and nourish the blood. In the West, dried goji berries (also known as wolf berries) are known for being high in antioxidants, rich in beta-carotene, thiamine, riboflavin, vitamin C, and amino acids. In the East, goji berries are used because they nourish "yin", enhance "chi", and tone the blood. Goji berries are believed to enhance the immune system, protect the liver, improve vision, deter tumors, and help eliminate fatigue. You'll see their seeds at the bottom of the soup. Dragon eye fruit (or long an rou) is similar to lychee nuts when found fresh in Southeast Asia. It is more commonly sold dried in the United States at asian markets. Long An adds natural sweetness to soup and is thought to nourish the blood. Long An is believed to be a food that calms the spirit, helps aid relaxation, and improves the appearance of skin. In Chinese medicine, Long An is a "heaty" food that reduces "wind" in the body, which is necessary for post-partum recovery. 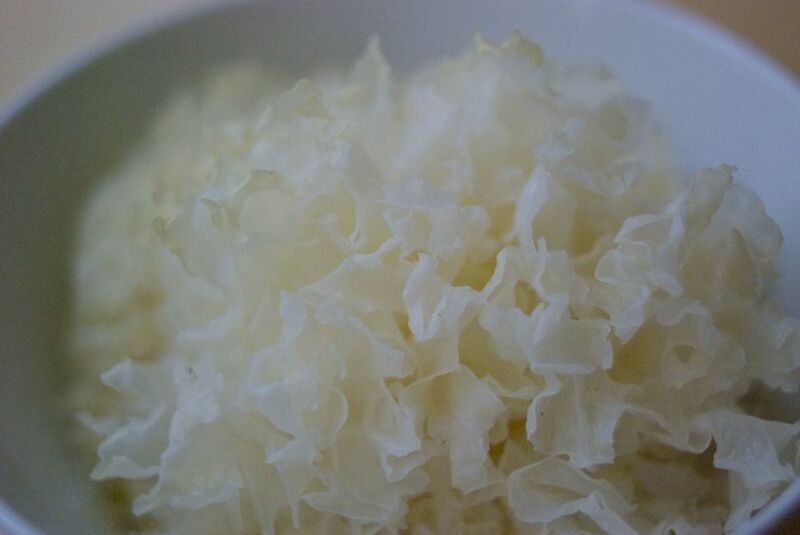 Snow fungus (aka tremella fuciformis or bai mu er) is believed to be an immune stimulant and treatment for exhaustion. This gelatinous fungi is pretty tasteless on its own, but take on the flavors of the other ingredients, kind of like tofu but with a frilly texture. Snow fungus is also known for moistening and beautifying the skin. Wood ear fungus is really easy to find dried, it's all over the place. But, if you want the really good stuff it's the fresh wood ear because it didn't go through the drying process and has an amazing bouncy texture. I have found fresh wood ear at Ranch 99 and Koreana Plaza in Oakland, but if you see it elsewhere do tell! In a big pot blanch the chicken bones and whole chickens by immersing the chicken in water and bringing it to a boil. Discard the water, keep the chicken. Add rice wine, water, and ginger to the chicken in the pot and bring to a boil. Simmer for four hours. The longer the better. Rehydrate the dried red dates, goji berries, longan fruit, snow fungus, and dried wood ear (if you're using it). Trim snow fungus (and wood ear) into smaller pieces and discard hard stems. Drain. Remove the chicken bones from the soup. Remove the whole chicken and discard the head and feet. Break up the rest of the chicken and toss it back into the pot. De-bone the chicken if you wish, or just keep the meat on the bones for the more traditional finger-licking style of eating. Add rehydrated and drained whole herbs to the pot. Now is the time for fresh wood ear mushrooms and raw peanuts to go in (if you're using these ingredients). Cook for at least one more hour. The longer the better. Add salt to taste. Or use soy sauce. Or, it is typical not to use salt at all since salt can make you swell and women who are recovering from childbirth would prefer to avoid any swelling. Eat the soup with the chicken meat on the bone. Avoid or discard the ginger (or not, if you like ginger).